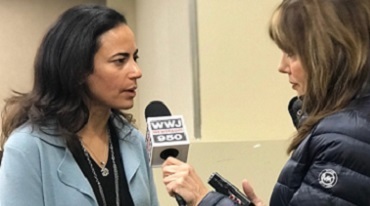 Sonia Hassan, M.D., is interviewed by WWJ-AM radio Nov. 1 after a panel discussion on preterm birth rates in Detroit. Wayne State University Associate Dean for Maternal, Perinatal and Child Health Sonia Hassan, M.D.,'94, was among the seven local physicians and School of Medicine alumni tapped by the March of Dimes last week to share their experiences and ideas for fighting the rising rates of preterm birth in the city of Detroit. The March of Dimes Premature Birth Report Card released Nov. 1 showed that among the 100 largest American cities - based on the number of births in 2016 - Irvine, Calif., once again had the best (lowest) rate of preterm birth at 5.5 percent, and Detroit now has the worst (highest) preterm birth rate, at 14.5 percent. Dr. Hassan is director of WSU's Center for Advanced Obstetrical Care and Research, located at Hutzel Women's Hospital on the Detroit Medical Center campus. The center is home to Make Your Date, a free program led by Dr. Hassan and launched in 2014 as Detroit Mayor Mike Duggan's answer to reducing the number of preterm births in the city by providing women with prenatal care, cervical length screenings (to determine preterm birth risk, an innovation born from WSU research), treatment if necessary, pregnancy education classes and group prenatal care. "Preterm birth is a very big syndrome, with really many, many causes, and the key is to target that person, and what is causing the preterm birth, like we did with cervical length," Dr. Hassan. "There is a lot more work to do in terms of funding, research and public policy." Make Your Date works for the 8,000 mothers who have participated. "We have shown preliminarily that the women in our program have a reduced rate of preterm birth as compared to those women who are not. We have shown it is something we can replicate in different places, and we have been asked to do that in different cities," Dr. Hassan said. "We are working with this wonderful group to reach every single prenatal woman in Detroit." The "group" Dr. Hassan is referencing are her colleagues at the Nov. 1 panel discussion "Premature Birth in Detroit," held at Hutzel Women's Hospital, which is also home to the National Institutes of Health's Perinatology Research Branch at Wayne State University. The panel was moderated by Patricia Wilkerson-Uddyback, M.D. '91 and included Obstetrician/Gynecologist Patrice Harold, M.D. ; Henry Ford Health System Emergency Medicine physician Kimberlydawn Wisdom, M.D. ; Henry Ford Health System Obstetrician/Gynecologist Richard Smith, M.D. ; Beaumont Health obstetrician/gynecologist Cheryl Gibson Fountain, M.D. '87; and Henry Ford Hospital Emergency Medicine physician and City of Detroit Health Department Director and Health Officer Joneigh Khaldun, M.D., M.P.H. Michigan remained at a "C" grade, but the state's preterm birth rate in 2017 increased from 10.1 to 10.2 percent and Detroit earned an "F" with the highest preterm birth rate (14.5) among major U.S. cities, according to the 2018 Premature Birth Report Card from March of Dimes, the nation's leading maternal and infant health nonprofit. For the third year in a row, more U.S. babies were born too soon with serious risks to their health. Premature birth and its complications are the largest contributor to death in the first year of life in the United States, and the leading cause of death of children under age 5 worldwide. In Michigan, the rates of babies born too soon (before 37 weeks of pregnancy) vary across population, with racial disparities and access to care as leading factors in preterm births. The preterm birth rate in the Michigan among African American women (13.9 percent) is 54 percent higher than the rate among all other women. In Detroit, the social determinants of health are significant. Eighty percent of Detroit's adults in homeless families are female, 41 percent of Detroit residents live at or below the Federal Poverty Level; nearly 50 percent of families with children, have a high housing cost burden of more than 30 percent of their income; and, 80 percent of births in Detroit are to unmarried mothers, with data showing lack of spousal support is a risk factor for premature birth. "Detroit is seeing more and more women enter pregnancy with one or more chronic health condition, which puts these women at a higher risk for poor birth outcomes. We have to do better. Funding from the public and private sector is the most important need," said Kara Hamilton-McGraw, the March of Dimes Maternal and Child Health director. Hamilton-McGraw announced One Key Question, a preconception/interconception education program, at the event. In partnership with the Detroit Regional Infant Mortality Task Force and Henry Ford Health System, One Key Question is an evidence-based intervention that promotes women's health before they become pregnant. In 2019 the program will expand to Detroit Medical Center, as well as Henry Ford Health System. The overall U.S. preterm birth rate rose to 9.93 percent of births in 2017 from 9.85 percent in 2016, according to data from the National Center for Health Statistics. While there is no single cause of preterm birth, research shows that chronic inequities and unequal access to quality health care have a negative impact on these rates. The continued rise in its preterm birth rate earned the U.S. a "C" grade on the March of Dimes Premature Birth Report Card. This year, 30 states had a worse rate compared to last year and 10 states received a worse grade. The report shows the racial, ethnic and geographic disparities in preterm birth within each state. The March of Dimes Premature Birth Report Card is based on final 2017 natality data from NCHS. Compared to 2016, preterm birth rates in 2017 worsened in 30 states, stayed the same in six states and improved in 16 states.